>> I Tried A French After Dinner Drink Made of Christmas Trees! A quick post to share with you what I’ve always known -the French can turn anything into an alcoholic drink. In this post, I share my newest discovery and my thoughts on this latest alcohol concoction. Voulez-vous un digestif Annie? “Would you like an after dinner drink Annie”? My Friend Marie and her husband Xavier invited Blake and I to their house for some home-made paella- which seems to be extremely popular here in the south of France, at least amongst our French friends. It’s popularity here in the south is probably a result of it’s proximity to Spain? 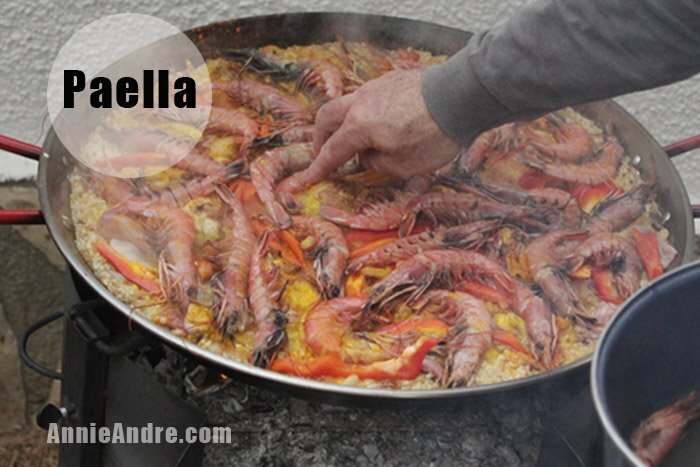 The Paella was excellent by the way. After dinner but before the coffee, Marie offered us a “digestif” (digestive)- a common practice among our circle of friends here in France. Only instead of offering me the usual faire of digestives, like port or sherry, she offered me a very special type of liqueur which made me do a double take. The label on the bottle handed to me had 4 cute little trees which immediately made me think of Christmas trees. 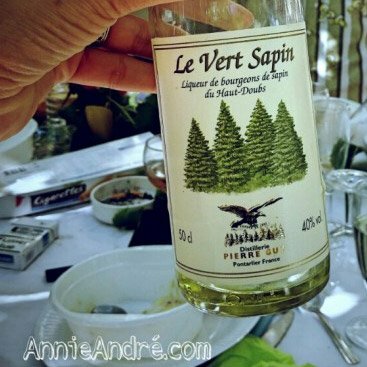 The label read “Le vert sapin” which means the “green Fir”. And as you know, some Christmas trees are of the fir variety. The Christmas tree visual along with the word “sapin” made me giggle. “I was about to drink a christmas tree as my after diner drink. “oh boy”. FYI, Christmas tree in French is “Sapin de Noel” which literally means “Christmas Fir tree” which is what you and I would simply call in english a “Christmas Tree” without the Fir part. What does green Fir liqueur taste like? In a word, this interesting after dinner drink, which is actually made from young pine needles was very sweet and tasted, in a word, Piney? I didn’t hate it but I didn’t exactly love it either. Although I really wanted to love it. According to the vert sapin site. This liqueurs is best drank as an after-dinner drink served cold or over ice. Its 40° so you can keep it in the freezer. You can also drink this after dinner liqueur hot with hot water and sugar. Or use it in cocktails, for cooking or use a splash of it to sweeten your Absinthe. Where to find or buy this after dinner drink? Fir liquor is nothing new. It was invented over 100 years ago by a Frenchman named Armand Guy who wanted to make a local liqueur. The Alps have lots of pine trees and fir trees so I suppose it made sense to turn them into an alcoholic beverage. 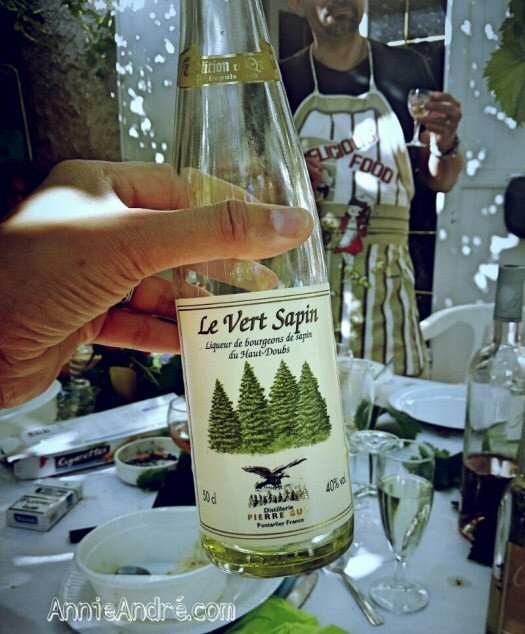 These days pine liqueurs and spirits are quite popular, mainly in the Alps which is where “Le Vert Sapin” distilliary has been located for over 4 generations being passed down from father to son. Don’t count on finding this Fir liqueur at your local grocery store in North America. It’s more of a novelty drink found in swanky bars and off the beaten path places. But if you do happen to find a place that serves it. Definitely give it a try. If you can’t wait and absolutely must have some now, you can order some at The master of malt store online.